My favorite Pandora station is going berserk. “Hip like a donkey” (that’s how I’ve named it) is no longer what it used to be. Sad. I’ve been nurturing this indie-folk station for years. I have upvoted and downvoted songs. Added variety — Pixies, Fleet Foxes, Deer Tick, Black Keys, Mumford & Sons, Lumineers; they’re are all there. I really put some effort and took care of it like it was my dog or baby. But over the last month or so, “Hip like a donkey” has been slowly becoming more and more rigid. It doesn’t play any new song and I keep hearing the same tracks over and over. The worst part is that they’re not even from current indie/folk artists. It plays The Beatles, The Rolling Stones, The Animals. Great bands (arguably some of the greatest bands of all time) but where’s my Mumford&Sons or my Deer Tick? Arghhh! Maybe I can abandon it in a reusable grocery bag on a car hood in a church parking lot. Or leave it tied to a pole on a street. Kind of extreme measures I know, but I’m so disappointed. I thought we had something beautiful going on, I feel betrayed. I switched to Spotify last week, but it’s not the same. Pandora plays, in general, better and more relevant music than Spotify (at least for me). With Pandora I discover new music in the genre by itself based on my thumbs ups/downs. Spotify’s has also a radio feature, it's not great though. The songs they string together seem disjointed and unconnected. All is well with Pandora, unless it go berserk. Like it happened with “Hip like a donkey”. So yesterday I ditched the on-line radios and played a CD from my collection — something that I hadn't done in years. And you know what guys? It’s actually pretty cool. Insert the CD, press play, and bon voyage! I should do this more often. As I was listening to R.E.M.’s “New Adventures in Hi-Fi" (oh, teenage years) I made these bad boys. Now I know that apples, cheese and turkey sound so pedestrian; but trust me, you are going to love these burgers. They’re really simple to throw together and they’re incredibly delicious. The apple and cheddar cheese really pump up the flavor all the while keeping them super moist and just marvelous. The roasted tomato tahini sauce is awesome and super tasty. A great alternative to mundane ketchup if you ask me. As you start making these burgers, I strongly suggest to slip in a favorite CD to set the mood. It’s as important as the recipe itself. Trust. 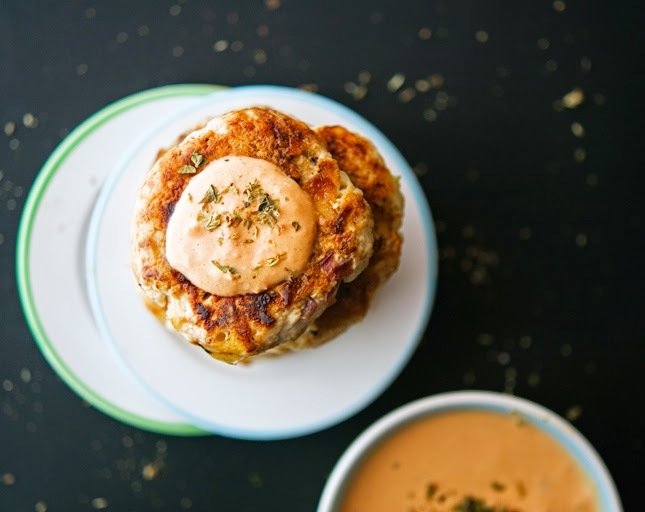 Apple Cheddar Turkey Burgers with Roasted Tomato Tahini Sauce Print this recipe! Grill over medium heat, flipping once until cooked through, about 8 minutes. Alternatively, heat one tablespoon of olive oil in a large skillet over medium-high heat and cook burgers until golden brown, about 6 to 7 minutes per side. To make the roasted tomato tahini sauce; thread cherry tomatoes onto metal skewers (or wooden ones soaked in water) and grill, turning frequently, until the skins begin to char and tomatoes are tender but not bursting, about 4 to 5 minutes. Place in a blender with tahini, vinegar, cayenne pepper and salt and blend until smooth. Add a couple of tablespoons of water if too thick. One burger (without sauce) yields 224 calories, 12 grams of fat, 6 grams of fat and 23 grams of protein. Coolest recipe and sounds but hey, since the summer is in full swing some sundazed electronica would do you good as well! Sundazed electronica? I have to check that out! I saw a pic of these and knew immediately that they were your creation. Awesome job once again Mike! And give Spotify a chance, it's all we use around here, any song you want, any time you want, it's the best! I'll give Spotify a chance, I promise....but I like Pandora so much, it's going to be hard! There's nothing pedestrian about these burgers, and that sauce has me drooling! What is it about Pandora stations? It seems like everything is going good, and then bam... same 20 songs over and over again! I hear you on the occasional cd listening. Especially in car rides, we pop in cds pretty frequently. And cheddar with apples is one of my favorite flavor combos. These look amazing!! OMG these look amazing. I have a few turkey/ chicken burgers in my playlist, I see this being a new addition soon! You have a perfect music taste hey! What a bummer that the station stopped playing cool tracks gah. Oh wow, perfect music taste you said? Thank so much Co. I know a few people who would disagree with you...but I know that I stand corrected, not them! Will have to make these this weekend! Sounds simple and delicious. I had broken up with Pandora quite a while ago....there's a new squeeze in my life named Songza. Songza? Never heard of it. I will try it soon, thanks for the tip! 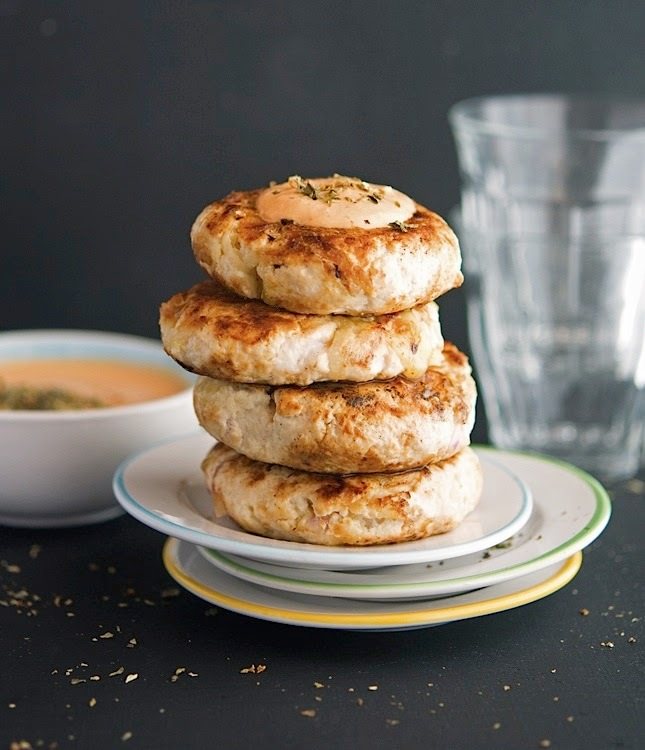 Love these burgers Mike and they are even more wonderful with that special sauce, oh I can see roasted tomato tahini on many other things in the near future. 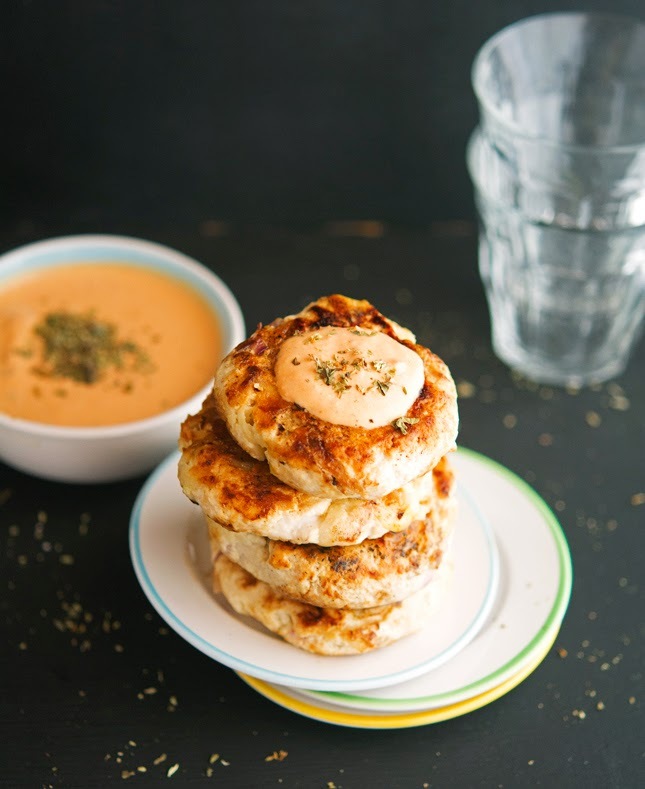 The roasted tomato tahini sauce is epic, seriously epic! Dude! Hip Like a Donkey sounds like the most amazing station ever. I always have Pandora playing when I'm in the kitchen baking. One of my favorite stations (which I recently nicknamed "Belgium the Great") is full of classic 80s rock. Like straight hair band style. There's something oddly comforting about baking cherry pie while listening to Warrant. You should try it. But your pie crust would have to be made out of cauliflower. Just sayin'. Hip like a donkey was the only relevant station in the whole wide world. For real. Too bad it went crazy. And I will totally make cauli crust pie, just to prove you that cauli crust is THE thing! Did you try shaking “Hip like a donkey”? Whenever my blender acts up, a good ol shake makes things all better...or maybe you should shake like you had a “Hip like a donkey” for your playlist to flip back? 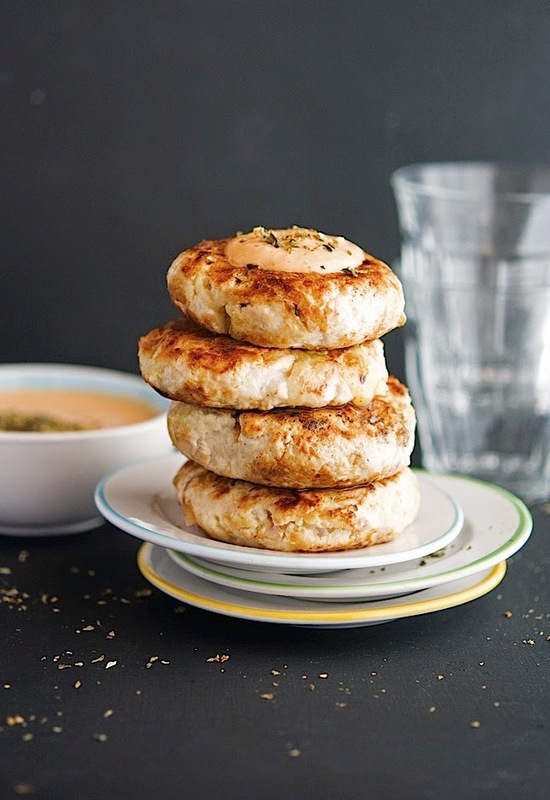 A friend I haven't seen in ages is coming over for lunch on Saturday and I think an adaptation of these burgers are most definitely a contender with an unadulterated version of that Roasted Tomato Tahini Sauce! Brilliant Mike! P.S. How bout taking David up on his suggestion to make a cauliflower crust pie - with one exception - we can switch out Warrant's cherry pie for Mumford and Sons' "Little Lion Man"? I did not shake it yet. I will try it right now and let you know. If you do make the burgers you have to report back, okay? Looks really good. I would not have thought of adding the apple. YOU sir are creative as FUUUUUUU******!! LOL! Sorry for the profanity but your recipes bring it out of me because I am in AWE!! Hi Mike! I just stumbled upon your blog, and I love it! Keep an eye out for typos and grammatical errors though. Your recipes look delish and are super creative! Can't wait to read more! Thanks Brittany, I'll try to be more careful, I promise! I have made twice your Thai-Flavored Honey Glazed Chicken (with Sriracha Mayo)... we loved it. Fantastic recipe! I was out of apples and used shredded coconut and it came out fantastic! I've been tossing the idea of cheddar apple cinnamon bites but this totally blows that out of the water! Can't wait to give this recipe a try.